My weekly game group has been helping me out playing through one last campaign of Griffins & Grottos before it releases in October. We've been playing through The West Road Warden adventure which releases this next week, so check that out. 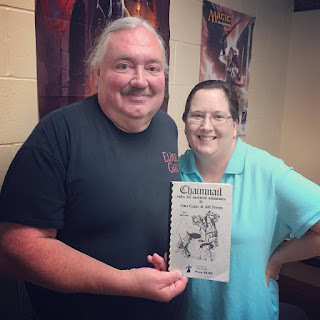 For the release, it is set up as a Narrative Adventure, a new product line for CMG, that makes it simple to use for any Medieval Fantasy roleplaying game system. More on that tomorrow, so stay tuned. I'll also have a one-shot of Griffins & Grottos at the next EN World Chicago Gameday on October 15th, 2011. It's the ten year anniversary of the gameday, number 30, since we do three of them each year. If you can make it to the event, please do sign up and give it a try. I'll have some pregen characters and no experience will be necessary. If you played any d20 games, you'll pick this up quite easily.